The Africanised honey bee is a hybrid of several European honey bee subspecies (Apis mellifera mellifera, A. m. carnica, A. m. caucasia or A. m. ligustica) and the African honey bee (A. m. scutellata). The Africanised honey bee occurs naturally throughout sub-Saharan Africa. In the 1950s the African honey bee was introduced into Brazil in South America for breeding purposes. 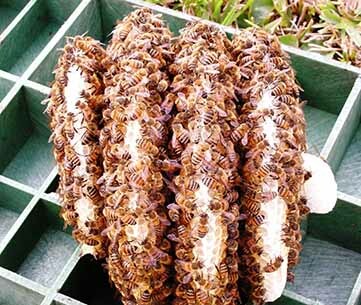 Unfortunately, the African honey bee escaped the breeding trial and starting breeding with the local populations of European honey bee (Apis mellifera). 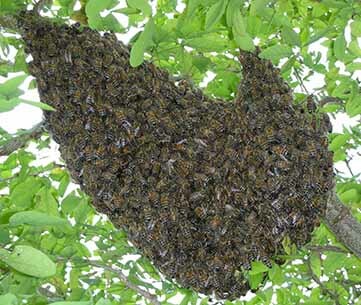 This was able to occur because all subspecies of Apis mellifera are capable of interbreeding or hybridising. Consequently, African honey bee hybridisation with European honey bees became frequent, as the African honey bee moved into areas which were previously occupied by European honey bees. The Africanised honey bees have a much greater aggressive and defensive behaviour than European honey bees and because of this rapid hybridisation, they were quickly able to out-compete the European honey bee. As of 2012, the Africanised honey bees had saturated Central and South America and had established in many southern states of the USA. As with all subspecies of Apis mellifera, the African honey bee and the European honey bee are able to hybridise. It is this hybridisation with the European honey bees that earned the name ‘Africanised’ honey bees. Therefore, the term ‘African honey bee’ refers to the pure race which is naturally found in Africa, while the term ‘Africanised honey bee’ refers exclusively to A. m. scutellata in the bee’s introduced range. Although measurement of wing venation, and size and colour of body parts can provide some preliminary diagnostic information, the only way to accurately identify whether a colony contains Africanised honey bee stock is through genetic analysis. Apart from being slightly smaller in size and a bit darker in colour, the Africanised honey bee looks nearly identical to the European honey bee to the naked eye. The main differences between these bees are displayed through their behavioural traits. Africanised honey bees swarm and abscond much more frequently than other races of European honey bees. Typical European honey bee colonies will swarm once every 12 months, while Africanised honey bees are capable of swarming every month or two which saturates the area with Africanised honey bees. Africanised honey bees have a heightened defensive behaviour compared to other European honey bees. 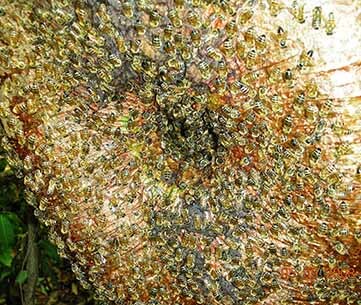 This can result in the Africanised honey bees defending a greater radius around their nest and attacking with many more individual bees than European honey bees would. Although they have been termed ‘killer bees’ in the USA, they do not have a more potent or a larger amount of venom than other honey bees, they just attack more aggressively with more individual bees. Africanised honey bees are less selective with nesting sites, and can nest in much smaller volumes than European honey bees. Africanised honey bees are more ‘flighty’ than European honey bees and commonly leave the hive when it is being inspected. 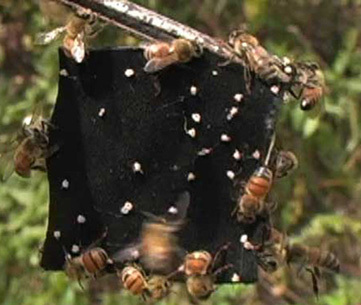 Africanised honey bee colonies produce more drones per colony than European honey bees and their colonies grow faster and tend to be smaller than European honey bees. Africanised honey bees also store less honey than European honey bees. The economic impact of Africanised honey bees in an area can be substantial. 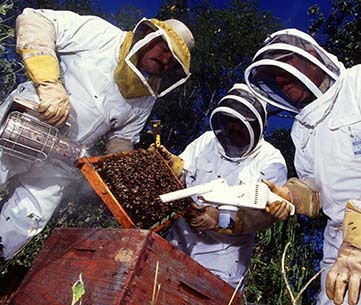 Reports from the USA suggest that there is a large reduction in resource availability for beekeepers in certain regions because of the density of Africanised honey bee colonies in an area. The effect that these bees may have on the native fauna and flora has not yet been fully understood. Because of the Africanised honey bee’s heightened defensive behaviour and their propensity to swarm more readily and nest in close proximity to humans, there has been an increase of Africanised honey bee attacks on humans and animals which can pose a serious risk, sometimes leading to deaths. In addition to the impact on resources, the environment and the public, the management of hives by beekeepers also dramatically changes. In the southern states of the USA, European honey bees have been replaced with Africanised honey bees. Attempts to reintroduce European honey bees into beekeeping operations have continually failed. For these reasons, beekeepers have had to learn the differing management practices and skills to efficiently and safely manage hives of Africanised honey bees. Since many African nations, as well as beekeepers in South America, keep Africanised honey bees many of their management techniques have since been adopted. This includes wearing additional and full body protective clothing, using copious amounts of smoke to lessen the defensive response of the colony, as well as keeping hives further apart from one another, which means that other colonies are not aggravated while working on one colony. However, it is important to recognise that many beekeepers in Africa and South America manage African and Africanised honey bees with very few problems, and are now starting to breed gentler strains of Africanised honey bees with greater levels of resistance to common honey bee pests and diseases. One of the major positives of African and Africanised honey bees is their increased resistance to a variety of pests and diseases that have decimated populations of European honey bees. 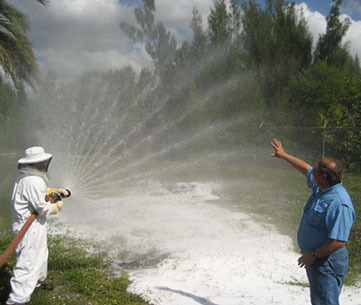 This includes a greater resistance to Varroa mites, American foulbrood, Tracheal mite and Small hive beetles. This greater level of resistance to these pests has also meant that their survival in the wild is favoured over that of European honey bees. Since the introduction of the African honey bee into Brazil in the 1950s, Africanised honey bees quickly spread throughout South and Central America at a rate of around 300 km per year. 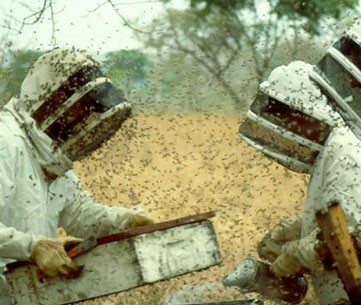 By 1990, Africanised honey bees had saturated South and Central America and had begun to move into the USA. In 2012, Africanised honey bees had been identified in the southernmost states of the USA including Texas, California, New Mexico, Arizona, Oklahoma, Louisiana, Arkansas, Alabama and Florida. However, since the Africanised honey bees have been found in the USA, their rate of expansion seems to have slowed which could possibly be due to climatic factors and the ability of the European honey bee to survive better in temperate climates. 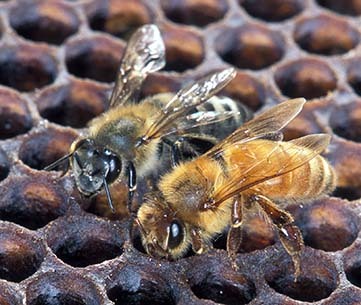 The Africanised honey bee is not present in Australia and there are strict quarantine requirements in place to protect the Australian honey bee industry. If you think you have seen the Africanised honey bee, call your local department of agriculture or the Exotic Plant Pest Hotline on 1800 084 881. This video was produced to help provide information about the pest’s life cycle and biology, identification and possible management options. Please be aware that the video was produced overseas, and treatment recommendations or conditions experienced may differ from those in Australia.